My first day was fairly easy, however it always takes that day for my feet to get used to walking and my legs to be aware that they are also carrying a rucksack and for me to slow down somewhat. One of the things I learned a few years back when walking the Camino de Santiago, was slow down – not to hurry everything – but it takes that first day to get this message into my head and body again. Walking a bit slower than normal makes life easy for my body and I always get to where I am going, maybe half an hour later – but that is fine as I get to really see all that is around me. Drymen is the last place until Crianlarich for any reasonable shops. There is one small one in Balmaha, bear this in mind if you are carrying your own food. Half an hour after leaving I pass through Drymen. 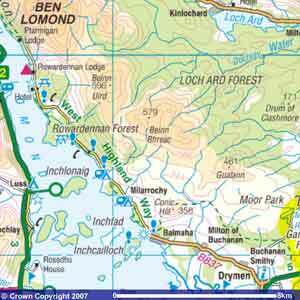 Today I am heading towards Rowardennan. Today is 25km instead of yesterdays easy 17km, I am looking forward to getting passed Rowardennan, I know all of this area from my childhood and look forward to leaving the known behind after Rowardennan. From Drymen to Balmaha is about 11km, a good place for lunch. There is a choice of routes here. Leaving Drymen there is the choice of two routes. The official route – walk east out of Drymen for about 500 meters, then it turns north. It is the longer route by far, however it is the most interesting, has great views, and stays away from the road all the way to Balmaha. It goes up into Garadhban Forest then round Conic Hill before descending into Balmaha. Half way along this route there is also an option to walk down and join the road at Milton of Buchanan, then continue along the road to Balmaha. The most direct route is to walk along the path at the side of the road, (B837), all the way to Balmaha. This is okay except for weekends when the road can be quite busy. The views walking along the road in no way can compare to the higher route around Conic Hill, it is mostly like a forest walk. In Balmaha there is shop, a cafe, a pub, and a visitors centre. There are buses back to Drymen, but none going any further towards Rowardennan. I often think that the distance between Balmaha and Rowardennan is very short, a few km’s, it’s not it is 11km, I am used to driving this road, and have parked many times at Rowardennan to climb Ben Lomond. The afternoon journey to Rowardennan should not be hurried. The path follows the edge of Loch Lomond, however it is harder than it first seems. There are many little ups and downs for the next 11kms, sometime the path follows the road – okay apart from high season, when the whole section is very and I mean very busy. However, please do not walk the whole length of the road here – keep to the West Highland Way route. Walking along the side of the road here can be dangerous, it is a very small road – often with too many cars. Only walk along the side of the road when there is a path at the side. Rowardennan is beautiful and a great place to chill and watch the sun set over a beer at the one and only local, which also provides accommodation as a hotel. However it is Rowardennan Youth Hostel for me, and a well deserved rest. Rowardennan Lodge, the Youth Hostel can be found here – however the link has changed at least once in the last few months – so if that does not work this is their home page where you can book online. Look up to your right – that is Ben Lomond – so perhaps it is worth an extra night here and walk up the Ben. It is fairly easy as Munros go, but still a days walk.